With no doubts, 2017 has been a Great year for the Nigerian music industry if you agree with me. There were quite a number of exciting songs that really hit up our playlist at the first quarter of the year. 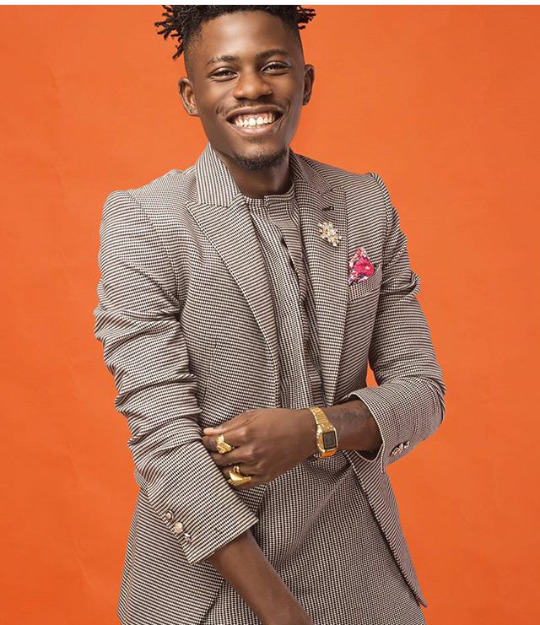 Earlier this year, we had a huge competition as to which song made the most ‘wave’ with arguments and discussions from fans all over Nationally & Internationally, YCEE’s ‘Juice’ and Davido’s ‘IF’ have been major hits so far that enjoyed massive airplay not just in the country , but also globally. However, Davido’s ‘if’ was sitting on the number one spot on the countdown earlier this year, and it got us wondering ‘IF’ it would be crowned the song of the year. Until the Jagaban crooner dropped the hottest ‘Juice’ for the season ! The Tinny Entertainment headliner, YCEE, lead the ‘Juice’ featuring Maleek berry off his E.P “The first wave”. 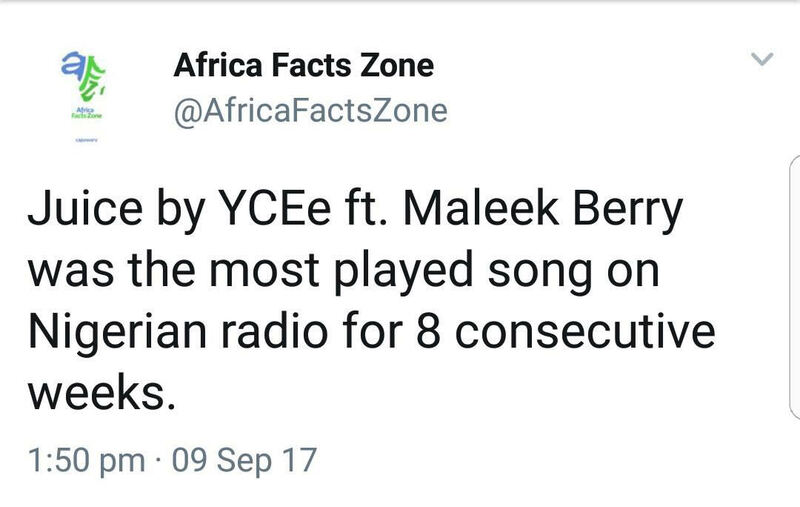 The all year banger became the most played song on Nigerian Radio for 8 consecutive weeks. 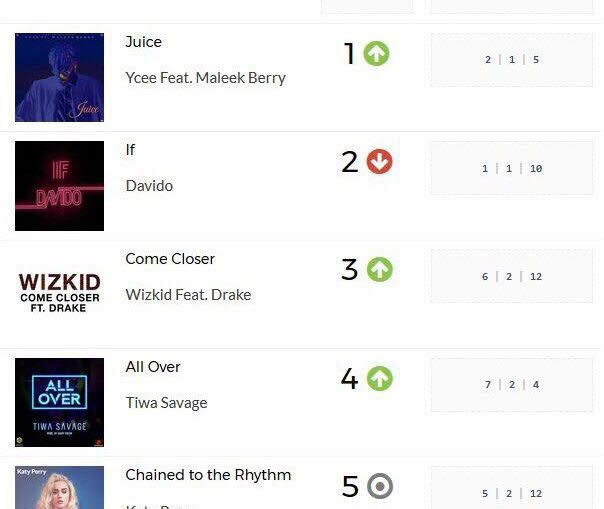 Do you know Juice was the only song ever to knock Davido’s hit single ‘IF’ off the countdown charts to retain and position at the top as ‘Juice’ became everyone’s favorite anthem immediately! The single produced by Adey swiftly rose to become a fan favourite and also became the soundtrack to the World and not just Africa. Juice can also be tagged as the influence of YCEE on Billboard’s “Next Big Sound”. The hit song became the most enjoyed on Nigerian radio stations , and even across the pond on influential music platforms in the U.K. Fans outside the country became more familiar with the chorus catchphrase “Too much Juice, Too Much Sauce”. 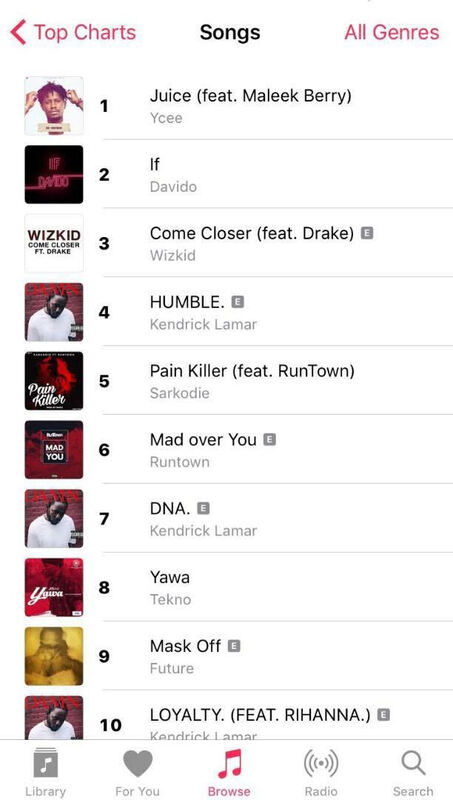 We thought YCEE’s ‘Juice’ topped only Davido’s ‘IF’ on the chart. Well, Newsflash; It comfortably sat on the number 1 spot on the iTunes chart ahead of ‘IF’ and ‘Come closer’. Even as Wizkid’s ‘come closer’ featured Drake. You shouldn’t forget that the fact they are both A-List artists, YCEE gave them a good run for their money despite Davido being backed strongly and Wizkid signed to SONY International. 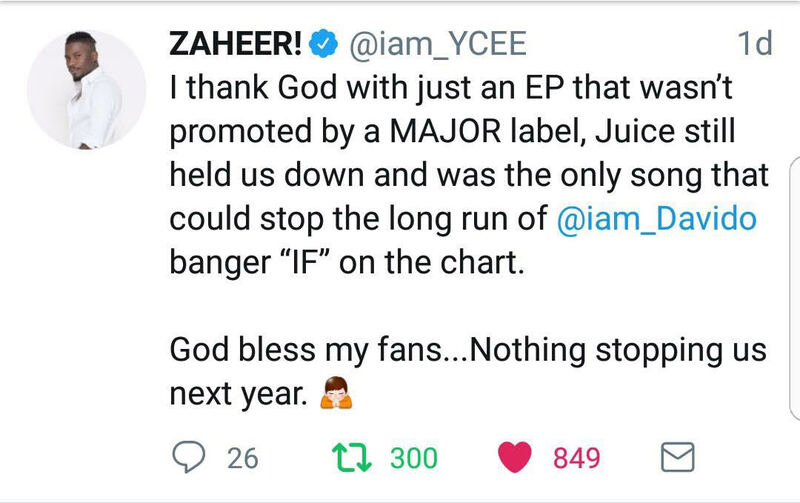 Without no sentiments or doubts, I believe JUICE has been the Biggest song for and from Nigeria this Year. YCEE also calls out to his fans on Twitter to expect so much more from him next year, Can’t wait for 2018 already.